Unlike other breeders, my girls have rich and full lives before they are bred bringing maturity and confidence to the whelping experience. Not only does this give the girls time to completely grow up (not babies having babies), but they pass their smarts on to their pups. This is an unusual year: I have two litters planned instead of the usual, one. Kai and I were busy on the show circuit. And Z was busy with co-owner Colleen Nolan rocking the coursing, rally, dock diving and obedience worlds (including the first and only AKC Utility Dog title in our breed!). Now we have a break, and it’s time to bring forth the next generation. 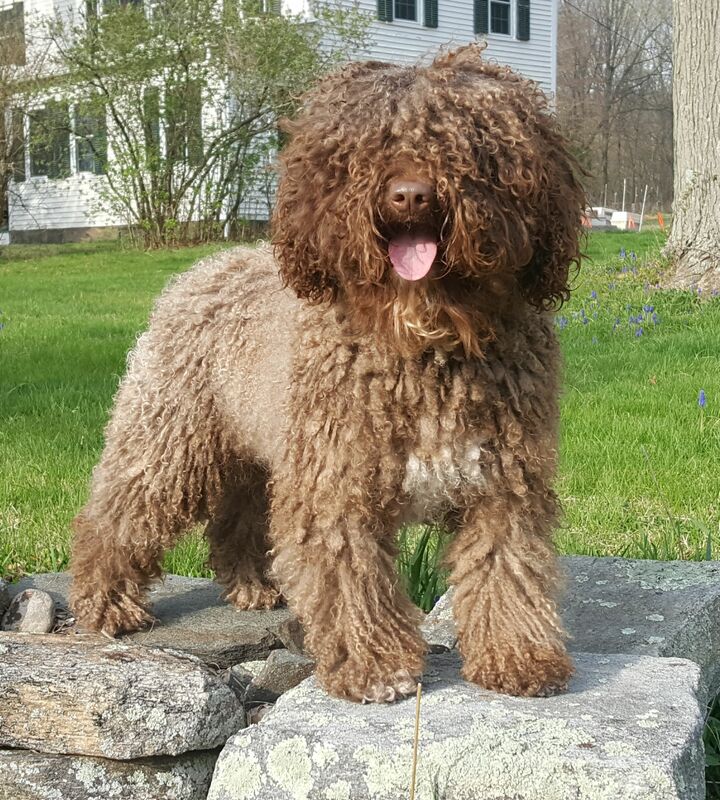 Scroll down to the very bottom to see the process for getting an Ariosa Spanish Water Dog. Now accepting applications for these high-drive working pups, due April 15, 2019. Please contact Lisa Harper at ariosaswds@gmail.com. Each of my litters has specific goals in mind. We are hoping Colleen will find her next great all-around puppy in this litter. The litter has two sires and each pup will be paternity tested before registration. Puppies in my home are always raised in the living room, in the middle of the action. Dam: GCHS CH Angel Kiss the S’Kai de Ariosa CD BN RE CAA BCAT CGCA, Multiple Group winner. This may well be the premier litter for 2019, blending our wonderful Kai with a top international star of similar type and temperament. Pups in this litter will probably all be solid brown. Kai is lovingly co-owned by Lisa Harper of Connecticut and Colleen Nolan of West Virginia. Lisa (that’s me!) does the showing and breeding. Colleen puts all those wonderful and diverse titles on the the girls! Pups are assigned to families according to each family’s lifestyle. Pups are evaluated for temperament at 7 weeks and conformation at 8 weeks. Competition, working, and 4-H homes are given top priority. Homes willing to keep their dog intact for possible inclusion in my show/breeding program are also given higher consideration. The process starts with an introduction email from you. Tell me what you are looking for in a pup, where you are located, and what your timeline is. That will get the ball rolling. Email address: ariosaswds@gmail.com . Next, fill out a questionnaire. Most breeders will have a questionnaire of sorts. Mine is designed for me to learn more about YOU, your dog experience, your household dynamic, what you do and don’t want in a companion. Some people go to town on these with photos and stories. I love that. Non-refundable $500 deposit. This tells me you are committed to getting an Ariosa pup. If you decide after making your deposit not to get a pup, the deposit is non-refundable. If, however, I don’t have a pup appropriate to you, then the deposit is fully refundable. Pups are assigned to families after their conformation evaluation at 8 weeks of age. Unfortunately, yearning for a particular pup from pictures does not greatly influence my placement decisions. Pups cannot be shipped. Puppies are to be picked up by their new family at my farm in central Connecticut when they are 8-9 weeks old. All pups will have docked tails and dew claws removed. This is done before 5 days of age when the puppies are not capable of forming memories of pain. 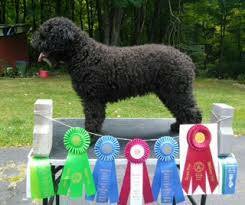 All pups will be registered with the American Kennel Club. Colleen and Kai, new coursing title! obedience, rally, coursing and the CGC series. As we say in the dog world, she’s titled on ‘both ends’, meaning she has AKC champion prefix titles and suffix working and companion titles. Not many dogs have that. Colleen and I are both all about the well-rounded dog, but we bring different talents to the table. Colleen thus far has trained Kai through top scores and titles in obedience, rally, coursing and CGCA titles. To squeeze in all of those titles with Colleen, Kai has been with me only a few months in her lifetime: at 1 yr for her Championship and now for her Grand. In her six shows since rejoining my crew in December 2016, she has earned (6) Best of Breeds including (2) 5-point majors, a 4-point major and a 3-pt major. Additionally, she garnered NOHS Groups 2, 3 and 4. Not too shabby. Keeping our eye on the prize: Westminster 2018. Kai and I have begun training for agility and hope to be competing by the end of summer. She’s happy, confident, responsive, and a quick and tireless worker; a real joy to work with. Kai’s also slated to dabble in herding and barn hunt before our national specialty this autumn. It’s going to be a very fun year. Stay tuned for more on Kai’s exploits! Apparently midnight is the perfect moment to go hog wild in play! Four weeks, three days, and they’re a hoot and a half. The pups still have no teeth but are now supplimenting mama’s milk with hard kibble. Moments before the video began, two pups crashed into the kibble bowl, hence the food on the floor. By this time, Dicha the Phenome-mama will have gotten in there and cleaned it up. Dicha is quite the good housekeeper.